I first met her at the Kaiwa office in June of 2006. We spent every day of that week together. Then in late August she came and visited me in the US. We met in New York a few days before Christmas to do some shopping for our families, then we came back to my house and she spent the holiday with my family. On her last day here, I asked her to marry me, and she said yes! I went back to Japan in March to meet her family. 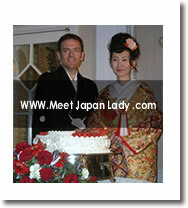 We decided on a Japanese wedding to be followed by a reception in the US.